Run IDM and enter your S/N in the registration dialog. The registration menu item becomes disabled once you will have registered IDM. 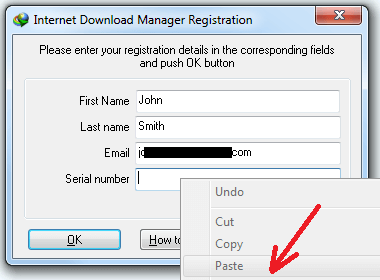 Open IDM registration e-mail, select your S/N, right click on it and pick "copy" menu item. In IDM registration dialog, enter your persoanl data, right click in S/N field and pick "paste" menu item. After the registration, pick Help->About from IDM main window. You should have the full version. Compare with the picture below. 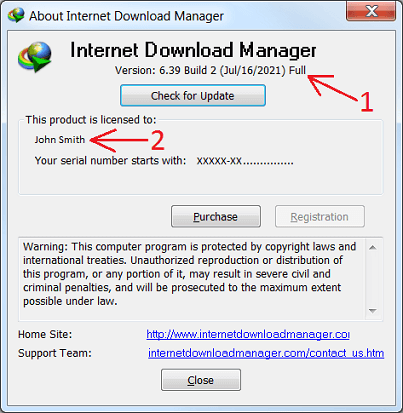 If you use Windows Vista or Windows 7, you may need to run IDM with administrator rights. Exit IDM (use "Tasks->Exit" menu item). 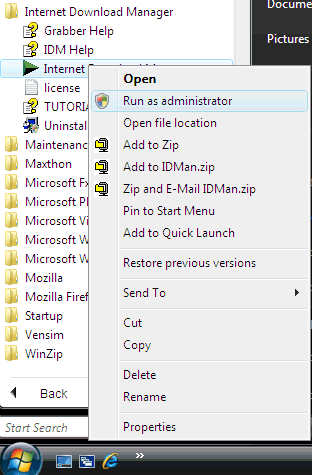 Then right click on IDM launch icon in Windows programs launch menu and select "Run as administrator" (please look at the picture below). Then register IDM with your personal S/N, exit IDM again and launch it normally.